[Brendan Vercoelen] is a university student in New Zealand studying engineering. He says his recent gigantic LED cube build, “isn’t very serious” compared to other student projects, but that doesn’t mean it’s not impressive. The original plan for the build was a 16x16x16 tri-color LED cube. After realizing how much soldering that really was, [Brendan] scaled back his design a little to a 16x16x8 cubeoid, but the other half can be attached when the project is complete. From the cost breakdown, [Brendan] only spent about $550 USD – far less expensive than we expected. The most expensive item was the 4,000+ Red-Green-Orange tri-color LEDs. The largest LED cubes (1, 2, 3) we’ve covered have maxed out at 8x8x8, or 512 total LEDS. Even though [Brendan]’s build is only half done, it’s still four times larger in volume than the largest LED cube we’ve seen. The gauntlet has been thrown down. This is the one to beat, folks. Check out a video of the cube after the break. Well, looks like my post stands corrected. And then a LED blows right in the middle! And no one noticed! I don’t think I would, only starts getting bad as whole columns start failing or the failure rate starts getting high enough. Getting 3D data from a 2D TV show would be nearly impossible, but I suppose at some stage someone would have said the same thing about colourizing black and white TV shows. Using current 3D films which are only stereoscopic would also be just as useless for a raw data source. So the only option would be to record your own data using some kind of true 3D video recording device. Possibly storing each frame as raw RGB voxels. But this would use a massive amount of storage and pushing that amount of data about for any real sized RGB display would rapidly get very scary. While doing true 3d would be difficult or impossible for the futurama intro, someone could just divide it into planes, and give it the appearance of 3d at least from one angle. you should have a look at their website mentioned in the end of the video, there’s much more to see there (click “more” on the website). Seems like they_re selling this stuff. Just curious, why no Blue? It’s not really “tri-color”. I expect the diodes are actually bi-color red/green. Those’d obviously be less wiring and probably cheaper than full tri-color with blue. The “third” orange/amber/yellow color is just what you get when you mix red and green. Bi- and tri-color both have only two LEDs inside. Difference being tri-color has 3 pins to allow both LEDs to be on simultanously. But you’re right, a lot of people commonly use the term tri-color to mean RGB. I was wondering the same, maybe the red/green/orange LEDs are cheaper? Yep your spot on. Including blue was just too expensive to keep under budget. There is still a large price gap between Blue LEDs compared to other colours due to the different technologies required to produce them. RGB cubes are exponentially harder to make than single color or bicolor cubes. 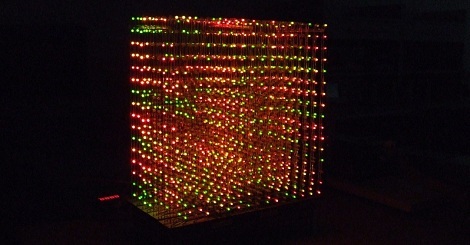 With an RGB cube you have the common cathode connection that is shared along a column, and then you have three sets of horizontal connection nets, one for each color of the LED. This results in a very complicated structure and mass of wires. Not only is it extremely difficult to put together (and have it look nice) but it creates very little through-cube visibility and it significantly diminishes the 3D effects of many animations. You simply can’t see as much of the cube with all those wires. Not to mention you then exponentially increase the overhead needed to run the LED’s. You need 3 PWM drivers (one for each color channel) for each LED and a column/row multiplexer to handle lighting individual LED’s. That doesn’t even factor in the overhead of the software needed to address and change color and brightness of each individual LED in the matrix. You need to write a very efficient animation engine that is modular and easily capable of writing “programs” for the animation. It’s simply unfeasible to program an animation voxel-by-voxel so you need to write modular cube transforms that will do things like scale, rotate, and move a cube “shape” in X,Y,Z directions. This way you can write new animations using the animation engine and provide inputs for color and brightness. Usually this has to be written in assembly for larger cubes and instruction cycles have to be monitored very carefully, unless you’re using a full size PC to run the cube hardware. Basically what I’m saying is that RGB cubes are DAMN HARD to build, and that’s probably why he decided to go with an admirable bicolor cube, which has more versatility than single color and much less overhead than RGB. To anyone who thinks it would easy to make an RGB cube, I dare you to do with a 5x5x5 cube let alone something this massive. You will soon realize how insanely complicated this kind of endeavor is. Of course a bi-color (e.g., red+green) LED cube is harder than a single-color, but how is RGB (tri-color) exponentially more difficult than bi-color? It’s only one more line per column, and in fact it’s proportionally less incremental complexity than the jump from single-color to bi-color (adding the 8 bi-color lines to the 16 single-color lines is a +50% increase; adding 8 more to make bi-color into RGB is 24 + 8 or only a 33% increase in the number of signals). Also, calling the red+green LEDs “tri-color” is ridiculous. If you are going that route (counting R, G, and R+G as separate colors), then RGB LEDs should be called hepta-color LEDs (7-color: R, G, B, R+G, R+B, G+B, R+G+B). What about black? Then red+green LED is four-color! What about dimming? Then red+green LED is infinite colors, or at least limited only by digital dimming control resolution…. I’m not arguing the semantics of “bi-color” vs “tri-color”. You are right, they should be called bi-color LED’s. But yes, adding an additional channel is a huge huge deal. Bicolor LED’s are just 3-state LEDs really, color 1, color 2, and color 1+2. RGB covers the whole spectrum and depends on your PWM resolution. It requires a major hardware redesign, tons of PWM channels, and it is REALLY hard to physically construct the cube without damaging it, not to mention exponentially more time intensive. Like I said, you can’t complain about how easy you THINK it is until you actually try it and realize it’s not easy at all. 25’000 voxles. Not as big as the Chinese one, but been there since 2006. @Don.. not too much money, just enough drive and ambition. Hope you get there some day… Best to you. That is so pretty. Good work my man! Great job, a lot of work! Does anyone make LEDs without internal reflectors? They might be better suited to these applications which require viewing from all angles. JOBGG > this one is hanging in a club. Counting on a freeze frame suggests this one is at least 48 LEDs high and is much wider than that. Can Hack a Day find out more details about this one for us all enjoy please?! how about a NSFW warning next time…. Sorry, only second place! The details were there all along – 12*24*48=13824. But it still looks like more – what trickery could this be?! Ah! Multiple (6) of the above LED cuboid modules working together to give 48x24x72 (=82944) !!! I want some of their products! Hmm… I really wouldn’t like to pay the electricity bill for this. 2000 watt average and 9000 watt peak power consumption for a 32x32x32 cube. You’d need like a 100 amp fuse (if the system is running from a 110 volt source). In Europe it would need a three-phase 16 amp circuit. I’d like to see Qix running in one of these cubes.